If you’ve ever suffered from TMJ pain, or temporomandibular joint dysfunction, you have probably experienced anything ranging from a dull ache to sharp pain in your jaw joints. Other symptoms of TMJ disorder include headaches and ear pain. The pain may cause a patient to have difficulty sleeping or concentrating during the day. For temporary relief, over the counter pain medications such as Advil or Tylenol may be helpful. 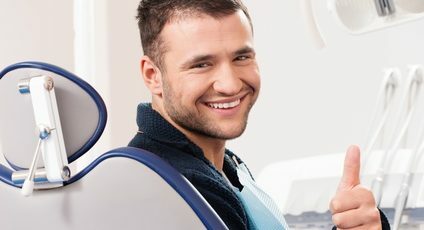 There are other things a patient can do to lessen the pain of TMD, including limiting caffeine and alcohol and managing stress- all of which can contribute to or worsen the condition. Eating soft foods such as pasta or applesauce while you’re experiencing pain can also help alleviate some of the pain and tension. However, getting to the root of the problem is key for successfully treating TMJ pain. TMD can be caused by a variety of factors, including previous jaw injuries, bruxism, and often co-occurs with chronic pain disorders such as fibromyalgia. At our clinic, we like to take into account a patient’s history before diagnosing the cause of or prescribing a treatment for TMD. Oftentimes, misalignment of the jaw or teeth can cause pain in the jaw joint area. If this is the case, orthodontics may be a viable solution. We have a variety of orthodontic treatments available, including traditional metal brackets and Invisalign. In cases where bruxism is to blame for TMJ pain, a mouthguard can help alleviate the pressure of teeth grinding on the teeth and jaw. Adults and children who grind their teeth at night should have a nocturnal bite plate or bite splint made to prevent tooth damage. If your wisdom teeth are erupting or are impacted, often time one of the symptoms is pain in the jaw area. If you still have all of your wisdom teeth, your dentist may recommend getting them removed to see if that eliminates the pain. In more extreme cases of TMD, oral surgery may be needed to correct the patient’s bite. In most cases, the cause of TMJ pain is multifactorial. At our clinic, we can work with you to determine the probable causes and work on a treatment plan.